My Foot Talk » Podiatry » General Questions, Recommendations, Advices » Soda and Osteoporosis: Is There a Connection? I went through a very interesting publication and I'd like to copy it here to let you read it. I'm a healthy man above 45 and according to my own experience I began getting issues with my bones after drinking Coke for a long period of time. These issues included neck pain, feet pain, toes problems, joint problems, etc. From the very first view it looked like artritis. But what a hell! It started so rapidly with no signs at all! Sometimes the pain was so terrible that I was unable to walk. These issues totally dissappeared after I stopped drinking Coke. It was interesting to understand the reason. One of my educations is chemistry and I spent some time thinking about possible correlation and reasons of my issues. To my surprise this problem was not new and I found many different articles on the Internet. Here is one of them. People, you'd better think about your health before you started getting problems and it's too late to do something. I hope to read here the comments and opinions from professional doctors. Does this sound like you? While everyone else is at Starbucks getting their morning latte, you're at the vending machine picking up a Diet Coke. And if you're going to a movie, the popcorn just wouldn't be complete without a large soda. But there may be a link between soda and osteoporosis that could be putting your bones at risk. Experts aren't sure why drinking soda is linked to osteoporosis. It may be simply that the soda is displacing healthier drinks in your diet. If you're guzzling a Pepsi with dinner (or breakfast!) you're probably not drinking the glass of milk or fortified orange juice that nutritionists recommend. "There is an association between people who have high soda intake and risk of fracture, but that's probably due to the fact that if they have a high soda intake, they have a low milk intake," agrees Robert Heaney, MD, FACP, a professor of medicine at Creighton University in Omaha, Neb., and a nationally recognized expert on osteoporosis. "Those things have been shown to be linked in various studies. But when you look at the ingredients of the soda and give those to healthy people and measure what it does to their calcium composition, nothing happens at all." "Individuals who drink a lot of soft drinks aren't going to drink as much nutritious liquid as others," says Bess Dawson-Hughes, M.D., professor of medicine and director of the Bone Metabolism Laboratory at the Jean Mayer USDA Human Nutrition Research Center on Aging at Tufts University. "We're simply not going to consume beyond a certain volume each day." So, if you just remember to drink a glass of milk for every can of Diet Coke, you'll be fine, right? Not necessarily. New research indicates that there may be more to the soda and osteoporosis connection than simply replacing the good stuff with the useless stuff. Researchers at Tufts University, studying several thousand men and women, found that women who regularly drank cola-based sodas -- three or more a day -- had almost 4% lower bone mineral density in the hip, even though researchers controlled for calcium and vitamin D intake. But women who drank non-cola soft drinks, like Sprite or Mountain Dew, didn't appear to have lower bone density. Phosphoric acid, a major component in most sodas, may be to blame, according to lead study author Katherine Tucker, PhD. Phosphorus itself is an important bone mineral. But if you're getting a disproportionate amount of phosphorus compared to the amount of calcium you're getting, that could lead to bone loss. Another possible culprit is caffeine, which experts have long known can interfere with calcium absorption. In the Tufts study, both caffeinated and non-caffeinated colas were associated with lower bone density. 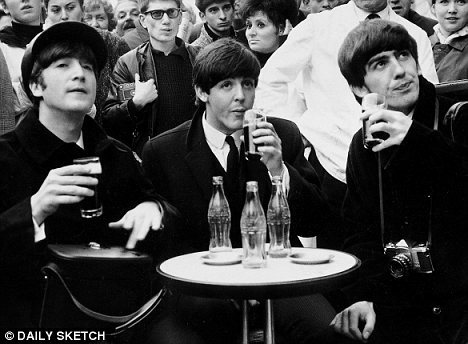 But the caffeinated drinks appeared to do more damage. This study isn't the last word on the subject. Some experts point out that the amount of phosphoric acid in soda is minimal compared to that found in chicken or cheese. And no one's telling women to stop eating chicken. Whether the apparent soda and osteoporosis link is due to effects of the soda itself or simply because soda drinkers get less of other, healthier beverages, it's clear that you need to be extra-vigilant about your bone health if you're a soda fiend. "Soda drinkers need to pay extra attention to getting calcium from other sources," says Dawson-Hughes. Can't give soda up entirely? Cut out one or two cans a day (depending on how much you drink). 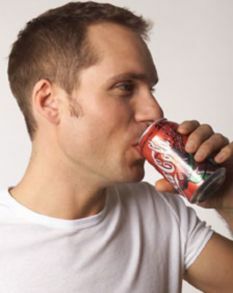 The Tufts study indicates that it might help to switch to a non-cola soda (like Sprite or Mountain Dew). Have a breakfast cereal fortified with calcium -- and pour milk on top. Add milk instead of water when you prepare things like pancakes, waffles, and cocoa. Add nonfat powdered dry milk to all kinds of recipes -- puddings, cookies, breads, soups, gravy, and casseroles. One tablespoon adds 52 mg of calcium. You can add three tablespoons per cup of milk in puddings, cocoa and custard; four tablespoons per cup of hot cereal (before cooking); and 2 tablespoons per cup of flour in cakes, cookies and breads. Take a calcium and vitamin D supplement if you aren't getting enough calcium (1000-1300 mg, depending on your age) in your diet. Get plenty of weight-bearing and resistance exercise. 4 users thanked DSh for this useful post. That's interesting! I got same feeling too! both 2-MI and 4-MI found in Coke are animal carcinogens. mixture of chemicals that does not occur in nature. A spokesman said: ‘Our beverages are completely safe. CSPI’s statement irresponsibly insinuates that the caramel used in our beverages is unsafe and maliciously raises cancer concerns among consumers. 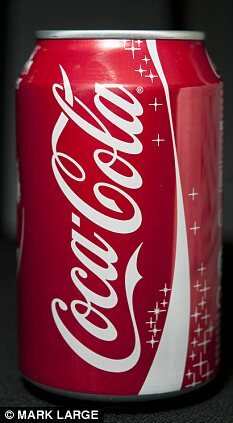 Coca-Cola said it was withdrawing the additive from Diet Coke in response to consumer demand for more natural products. But the company said at present it had not found a satisfactory alternative to replace the additive in some soft drinks with a higher juice content including Fanta and Dr Pepper. Other fizzy drinks made by rival companies, such as Irn-Bru, Pepsi Max and Lucozade will continue to contain the additive. While the chemical occurs naturally in some fruits, such as prunes, apples and cranberries, it is used in much greater strengths by the soft drinks industry. However the government-backed Committee on Mutagenicity - which investigates whether chemicals cause cancer - has dismissed the research. The panel argue that while Sodium Benzoate has been shown to be harmful to yeast cells, it argues that human cells are stronger. But Professor Piper called the dismissal a 'whitewash' that failed to take into account modern techniques of monitoring DNA damage. Research by Southampton University found that sodium benzoate was one of seven additives - the six others being food colours -that can lead to hyperactivity. The Food Standards Agency called for the six colours to be withdrawn from UK products - although sodium benzoate has been allowed to remain. 'For a number of years we have been moving towards non-artificial colours, flavours and preservatives where possible in our drinks. The company stressed that E211 was an approved additive by many worldwide bodies including the European Food Standards Agency. I'm sure MythBusters found a much better usage of Coke! Although it's diet coke, but think what happens after you drink that! Hey Paula, did you think how it works with different Coke flavors? It can be a very good addition to children parties, not for drinking of course! Let me join your conversation. Although this topic is old I'd like to make an update. I just found a new article on the Internet and I think it's good for this topic. 20% of people with osteoporosis are men. What causes it, and what can you do about it? Real men get osteoporosis, too. As many as 2 million American men already have osteoporosis, the bone thinning that makes bones brittle and porous and at likely to fracture. Twelve million men are at risk, and may have early signs of bone loss and low bone density, called osteopenia. But given that four times as many women have osteoporosis, men are less likely to end up with thin bones than women.